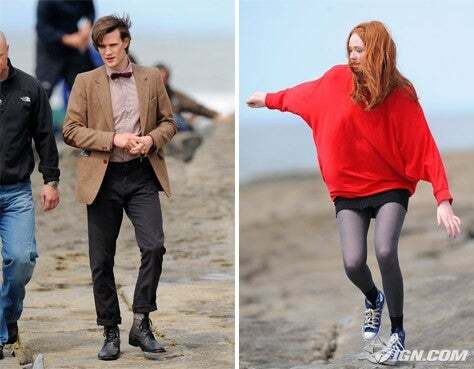 The BBC has revealed Matt Smith, Doctor Who's 11th incarnation, in full costume for the first time, with shots of the actor filming on a beach in Wales hitting the net. The Time Lord's new garb could be described as professorial, and harks back to earlier Doctors Patrick Troughton and Jon Pertwee - who both also wore bow ties. The pic also shows Karen Gillian, who will play Smith's assistant Amy Pond. Steven Moffat is taking over from Russell T. Davies as the series producer, with the season set to begin in spring 2010. 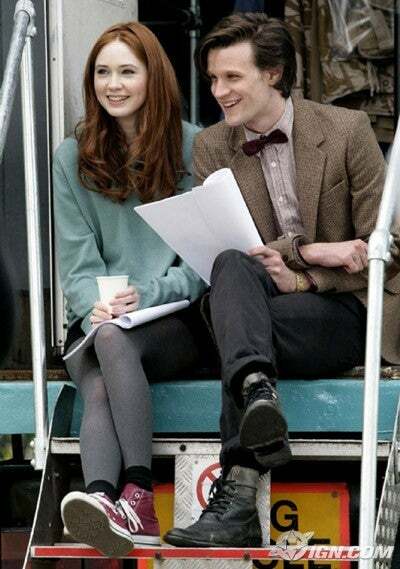 Matt Smith's Doctor and Karen Gillian as his new assistant. BBC Wales bigwig Piers Wenger said of Moffat: "The scripts for the new series are every bit as funny, thrilling, scary and imaginative as you'd expect from the man who brought us 'The Empty Child' and 'Blink'. There's a strange and perfect alchemy between Steven and Matt Smith and the next few months are going to be riveting as that relationship starts to emerge on screen." WalesOnline has some more pics of the duo filming in near Cardiff, click on the images below to see the full set. The pair filming in Wales. Click on the image to see the full set.